Park in front of the railway station. Corner of Hamilton Street and Fimiston Street. This memorial commemorates World War I.
Dulce et decorum est pro patria mori This monument was unveiled by Major General Sir Talbot Hobbs 25 – 7 - 1920. This must be one of the earliest War Memorials after the war. Major General Sir Talbot Hobbs had a significant, distinguished and complex role in the Australian contributions to World War I. 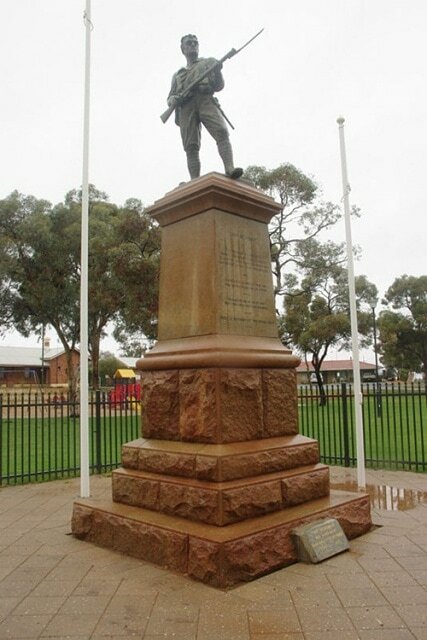 He also unveiled the Kalgoorlie War Memorial in 1923.